The free Balloon Loan Payment Calculator is a template that shows you how to make balloon payments to lower your debt quickly and effectively. The template is easy to download and only requires you to enter 5 pieces of information about your loans and debt. The template will use that information to generate a list of your payments from now until the debt has been repaid. The free document also gives you helpful graphs and your monthly payments over time. You can use this data to make an informed decision about your options. Make the right decision for your debt this year by downloading the free template today. To download the free template, just follow the link at the bottom of this page. Start at the top of the page and enter your loan amount (which in this example is seen as a million dollars). Next, enter the interest rate, amortization period, payment period, and finally the payment start date. That’s it! You’re done. The template will take the data you entered and give you some important details in the top right corner of the page. You can see the monthly and total payments that you’ll spend over time. The interest in the example amounted just under 60,000 dollars in this period. You will also see the monthly payments as well. If you scroll down a little further on the page, you can see your “AMORTIZATION SCHEDULE.” You can see how your amortization effects your payments over time. The table displays all your payments from start to finish. Finally, the graph to your right shows the total interest and the loan amount in a pie chart. You can see that the vast majority of this example loan comes from the principle balance. 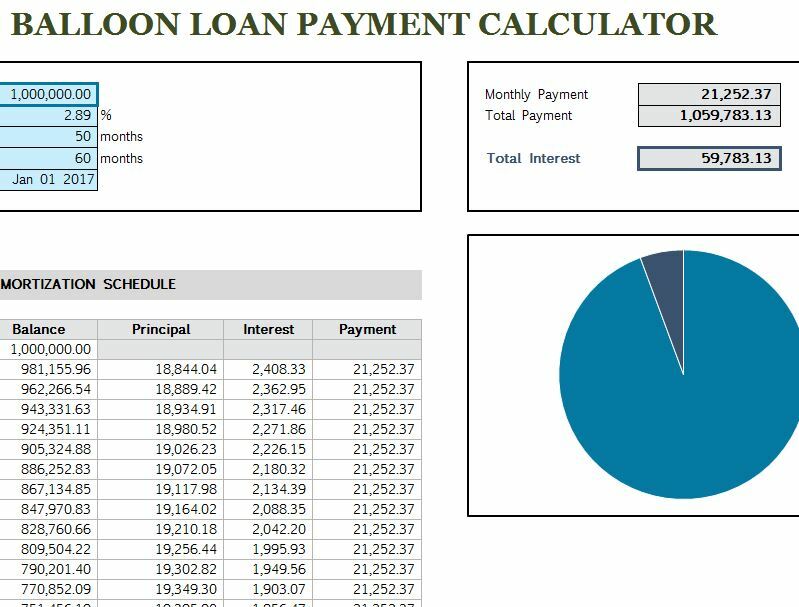 You can use this free template to quickly calculate balloon loan payments to find the best option for you.